During school years, the phenomenon of peer pressure begins to become a very powerful force. Children see what’s packed in each other’s lunches. And, yes, it’s not unusual for your darling to trade the apple for potato chips or the carrot for a candy bar. If they don’t bring their own lunches, the choices available at the schools usually get broader (and less healthy) as the years go by. 1) Kids are interested in health. They can learn the difference between healthy food and junk food. They can learn to read labels. They can learn to avoid harmful ingredients. Encourage your children’s teachers to teach the class at least a little about good nutrition at the beginning of each year. If eating well is confirmed by this outside authority and is tied in with success at school, it will help. Encourage this when you eat out by trying to identify (together) the most healthy and least healthy choices on a menu. 2) Connect with the parents of your child’s class about how important peer pressure is at this age. Make a list of the kinds of foods that would be great in lunches and the kinds of foods to avoid. 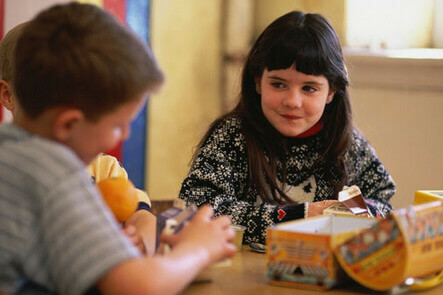 Encourage the parents to band together to help healthy food be the norm for that class. What’s cool in a particular classroom is more important to kids than what’s cool nationally. 3) Make your kids’ lunches the coolest. Use a wide variety of foods your child likes. Don’t let them get boring. You could use a different fruit everyday for a month! Make it an event (guess the fruit–no peeking!). You could even send clues along about tomorrow’s fruit, so everyone is trying to guess. Another month, carve faces into some carrot sticks. They can name the carved carrots and eat the best one last. Or try fortune vegetables–instead of fortune cookies. I can remember being told, “Don’t play with your food.” I’m telling you the opposite. Learn to play with your children’s food. You’ll have a great time and make a big difference for them. A promising trial called the CATCH Study (Child and Adolescent Trial for Cardiovascular Health) was completed a decade ago. Over 5,000 third graders at 56 schools scattered across the country participated. In 40 “control” schools, no interventions were made. In the study schools, nutrition was added to the curriculum, and the school lunches themselves were made healthier. The kids were followed up through third, fourth, and fifth grades. Complete dietary assessments showed that, in the study schools, the amount of fat in the diet decreased significantly from 39% to 32%, whereas in the 40 schools in which no changes were made, the amount of fat intake did not change. Eating well can be learned Journal of the American Medical Association, March 13, 1996. The best way to sustain good nutrition throughout adolescence and adult life is to learn it while we are young. By the teenage years, many habits have already been set. “See ya,” your teen tells you as she heads out of the house. By this time, most of her eating habits have been established. If they are bad ones, this is not a good time to enter a conflict about the issue. Later in life she may be ready to revisit this issue, as some of you are now, but as an adolescent, there are many more pressing issues. About 20% of adult height and 50% of adult weight are gained during adolescence. Most boys double their lean body mass between the ages of 10 and 17 years. Because growth and change is so rapid during this period, the requirements for all nutrients increase. This is especially true of calcium and iron. Calcium is found in milk, yogurt, dark-green vegetables (such as collard greens, spinach, turnip greens, and kale), cheese, pudding, sesame seeds, tofu, bok choi (Chinese cabbage), canned non-boneless salmon and sardines, and cottage cheese. Some brands of orange juice are fortified with calcium. Calcium is also available in dietary supplements. Adequate calcium intake during adolescence results in fewer teenage broken bones. More importantly, it increases maximum bone density, reducing the risk for osteoporosis later in life, especially in postmenopausal women. People reach maximal bone density while they are adolescents or young adults and then gradually lose bone the rest of their lives. The more they start with, the more they will end up with. The amount of calcium consumed during adolescence correlates directly with the total bone mineral content measured on adolescent X-rays Journal of Pediatrics, April 1995. Most teens consume less than 1,000 mg of calcium per day. Those who do nothing more than take a 500-mg calcium supplement boost their intake from 80% to 110% of the RDA. This results in a significant, measurable increase in bone density and bone mineral content of the spine (Journal of the American Medical Association, August 18, 1993), but these benefits disappear within 18 months if teens return to poor calcium intake AAP News, February 1997. Teens who consume 1200 mg of calcium per day are also measurably stronger than those who don’t. A study of 162 Icelandic girls found their grip strength (an estimate of total body strength) to correlate well with their calcium intake Journal of Internal Medicine, October 1994. Some teens I know drink diet colas as if they were water. You’ve heard of chain smoking–these kids do chain soda drinking. One can pops open almost before the previous one is empty. I have even heard of teens that pride themselves in drinking a 2-liter bottle of diet soda instead of eating lunch! A high consumption of carbonated cola beverages reduces bone mineralization and makes teenage girls almost four times as likely to break a bone than their male counterparts Journal of Adolescent Health, May 1994. Rob, one of the adolescent boys in my practice, loved to compete in track and field. His running times in his sophomore year of high school were excellent, but try as he might, his times began to fall off during his junior year. The harder he trained, the poorer his times got. A blood test during his physical showed him to be anemic–not enough oxygen-carrying red blood cells. The anemia came from iron deficiency. Anemia is common among adolescents, regardless of their level of physical activity. Iron deficiency is the most common cause. An inadequate diet is the chief reason for this problem. Junk food diets can easily lead to iron deficiency. Teens on a weight-loss diet are especially at risk, as are girls with heavy periods. Iron deficiency is sometimes made worse by intense and lengthy physical training and by the use of pain medications, which irritate the lining of the stomach. The best way to get more iron is through iron-rich foods. Click here for a list of iron-rich foods your teen may enjoy. Iron supplementation significantly improves learning, memory, and cognitive test performance in iron-deficient adolescents (even if they are not deficient enough to become anemic) (Pediatric News, January 1997). Iron supplementation also measurably improves the performance of iron-deficient, anemic athletes American Journal of Diseases of Children, October 1992. Rob made changes in his diet and also took an iron supplement for a while. His performance improved steadily. (By the way, iron supplements do not improve the performance of non-anemic athletes). To make dietary changes, information should be presented about short-term consequences, particularly related to appearance, athletic ability, popularity, and enjoyment of life, because these are more important to most teens than long-term health. For instance, adolescents can be told, “Calcium will help you grow taller during your growth spurt. It also makes you measurably stronger. Iron will help you do better on tests and stay up later without being as tired. Carrots will make you a better driver, and will make me more comfortable lending you my car,” and so on.